The latest version of WhatsApp Beta adds an option to the Privacy menu for authentication via a saved fingerprint. Unfortunately, this function is not actually live yet; however, it clearly indicates that the messaging app's developers will make it available in a future version. Reports suggest that it will be compatible with Android devices with version 6.0 or later and working fingerprint sensors. Wabetainfo.com is a website that documents the new WhatsApp Betas for Android and the new tweaks or features these preliminary updates bring. It has noted that the latest version of this beta (2.19.3, whereas the official version is up to 2.18.38) has added an option to authenticate users via fingerprint sensing. This is the first time WhatsApp has given a hint that fingerprint unlocking of any kind is coming to the popular messaging platform. 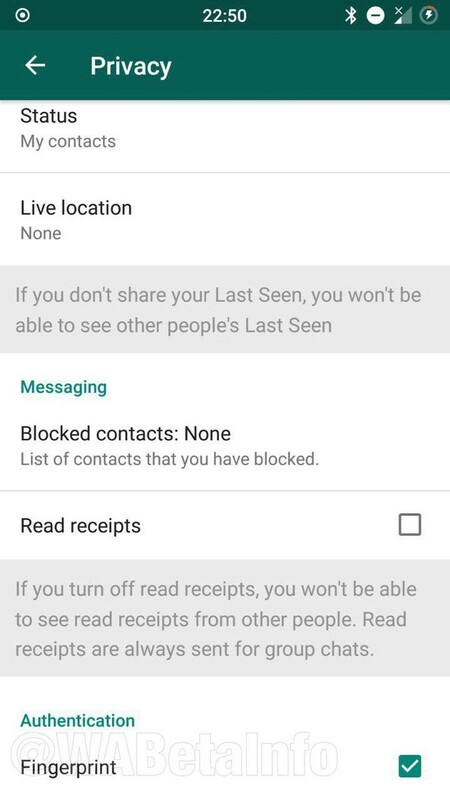 However, the new feature, which is found under WhatsApp Settings>Privacy, is not operational yet. This indicates that it is in alpha at present. On the other hand, it is somewhat concrete evidence that WhatsApp developers are indeed refining this form of authentication at the moment. The 'fingerprint' option also still allows for the use of device credentials as an alternative method of user-recognition. This new WhatsApp privacy setting is apparently to be made available to devices that run Marshmallow (or Android 6.0) and so on, and are equipped with a fingerprint reader. Unfortunately, the Beta changelog-tracking site could not give an ETA for this new method of protecting your messages or backups from prying eyes.